Yoshihisa Hashimoto (橋本 善久) is a former Sonic Team programmer, designer and director. He was best known for directing Sonic Unleashed and the Hedgehog Engine. 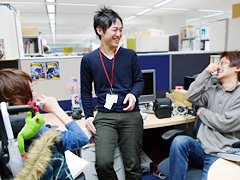 He left Sega and Sonic Team in 2009 for Square Enix, where he became the technical director of Luminous Studio. The engine would later be used for Final Fantasy XV. In spring 2014 he left Square Enix and established Libzent Innovations in August of that same year and is serving as its representative director.